Adrienne and Kevin had their ceremony and reception at the I Hotel. It was very elegant. 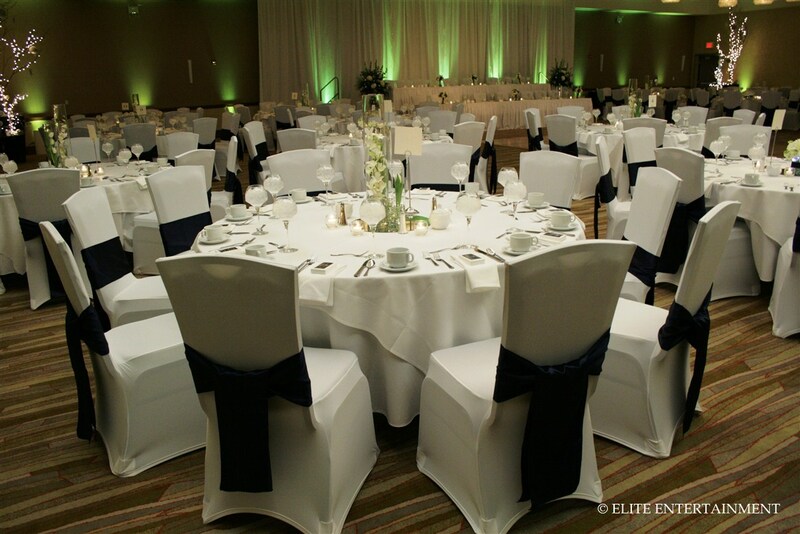 We provided white stretch chair covers with navy blue satin sashes in a foldover tie for a more sleek and sophisticated look. We also added amber uplighting around the room to create a more intimate atomosphere. They placed programs on the chairs for guests to pickup as they sat in their seats. They had tall and short vases with candles that lined-up along the aisle. 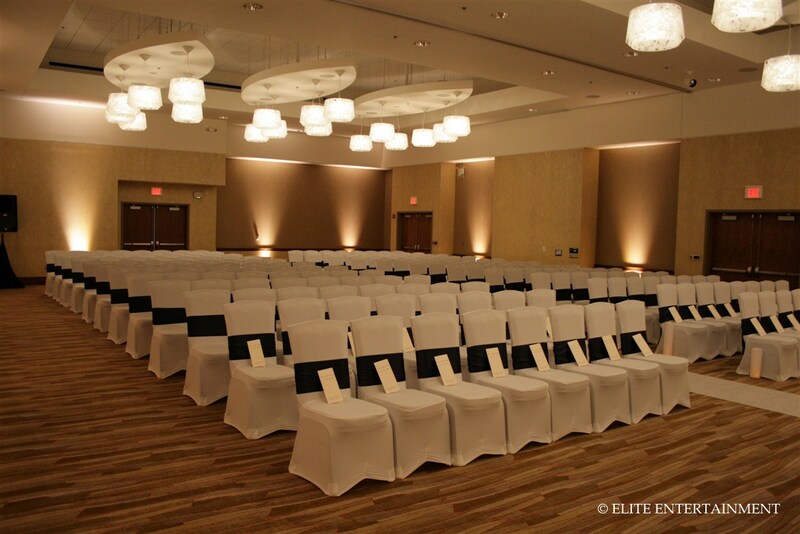 Then we provided a white backdrop with uplights at the front of the room. Everything came together so nicely and looked beautiful! 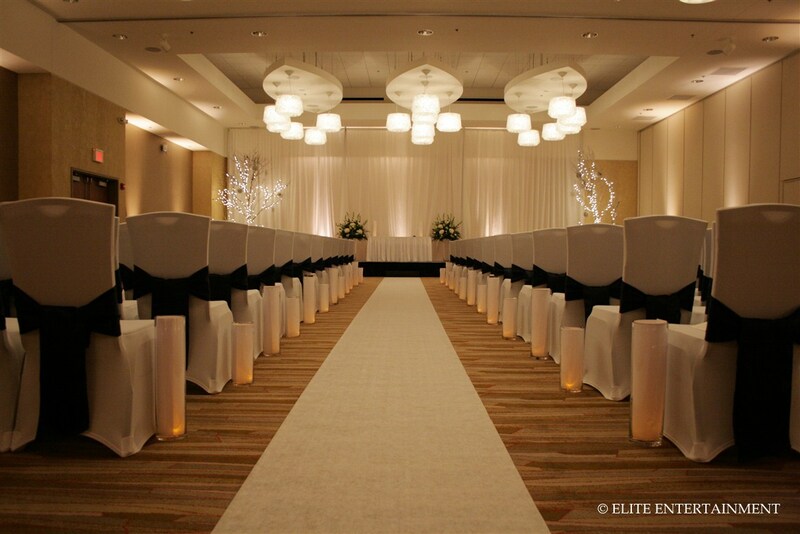 Once the ceremony was over, staff of the I Hotel flipped the ballroom for their reception. Adrienne and Kevin formed a receiving line and took pictures while the room flip was going on. 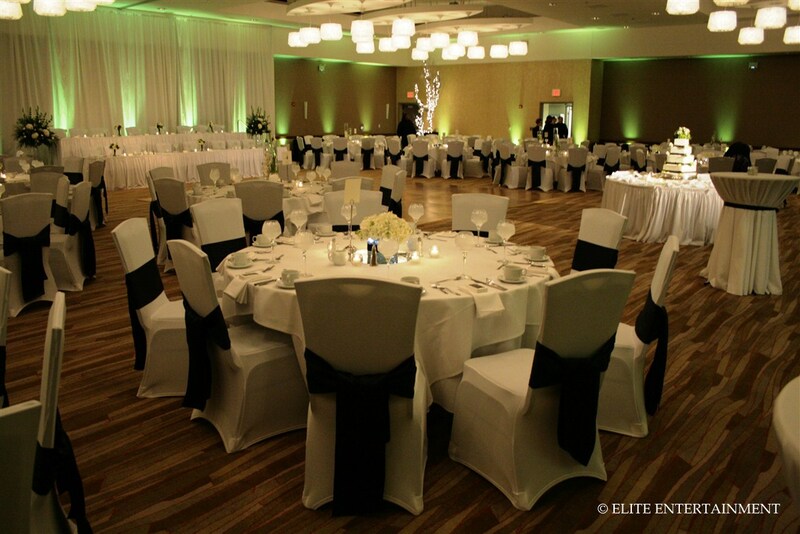 All of the chairs were transfered to the reception, the tables were set, and reception began. Adrienne and Kevin had their first dance immediately following introductions. Dinner, cake, and toasts followed their first dance. Adrienne and Kevin’s colors were white, navy and green. Their table setup was done in mostly white linen with the exception of our navy blue satin sashes around the chairs. Their centerpieces varied between tall cylinder vases and short ones with all white flowers. 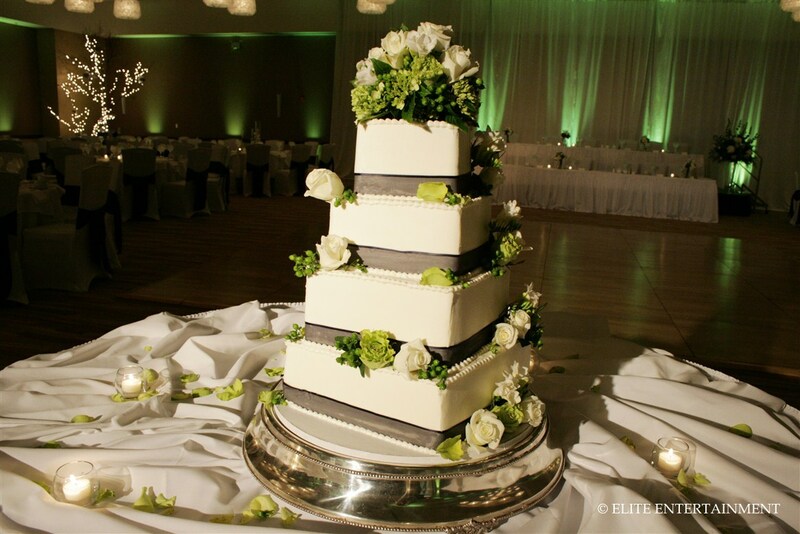 Their 4-tiered cake sat in front of the DJ booth across from the head table. We spotlighted it to make it a focal point in the center of the room. 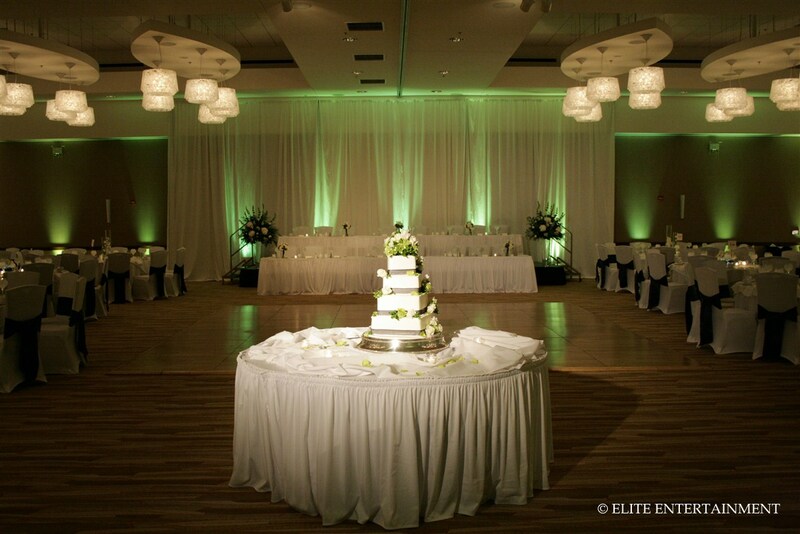 We also provided a white backdrop behind their two tiered head table, and added green uplights which looked awesome! 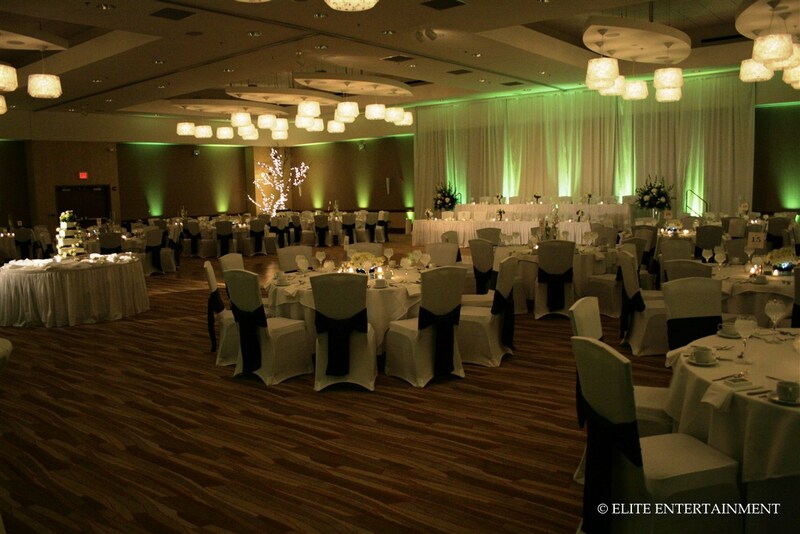 We love how they chose a soft lime green for their uplighting color. It gave the room a more “party feel” while keeping it elegant at the same time. This was a very fun wedding. Since it was New Year’s Eve, the I Hotel distributed champagne to all the guests at 11:30. We played “Auld Lang Syne” at the strike of midnight as we did a count down to the New Year! Guests were able to continue the celebration until 1:00am. We wish Adrienne and Kevin Hay’s a very happy marriage! ~ by Elite Entertainment on January 4, 2012. This entry was posted on January 4, 2012 at 4:39 pm and is filed under I Hotel.You can follow any responses to this entry through the RSS 2.0 feed.You can leave a response, or trackback from your own site.